"The Story of Red Jacket"
The story of the great Seneca chief Red Jacket is told in this year's Six Nations native pageant beginning tonight near Ohsweken. 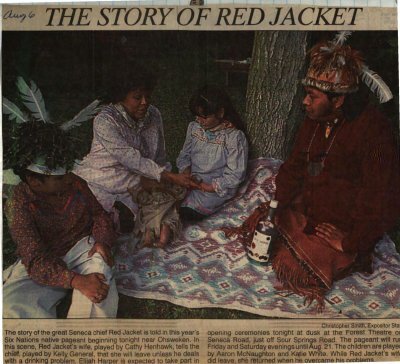 In this scene, Red Jacket's wife, played by Cathy Henhawk, tells the chief, played by Kelly General, that she will leave unless he deals with a drinking problem. Elijah Harper is expected to take part in opening ceremonies tonight at dusk at the Forest Theatre on Seneca Road, just off Sour Springs Road. The pageant will run Friday and Saturday evenings until Aug. 21. The children are played by Aaron McNaughton and Katie White. While Red Jacket's wife did leave, she returned when he overcame his problems. Henhawk, Cathy ; Harper, Elijah ; McNaughton, Aaron ; White, Katie ; General, Kelly.